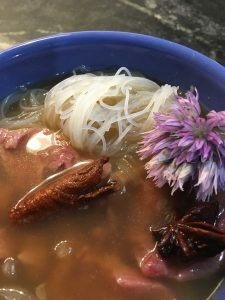 Basic method for something beef pho-like (no claims to authenticity, as I am new to cooking this kind of food). Start with beef broth (in my case, boil several cups of water and add beef broth paste). Add some sliced onion, sliced carrot, fresh ginger, garlic, jalapeño, cilantro, Thai basil, scallions or chives, cinnamon stick, star anise, salt. Simmer until well-blended and tasty.